Calypso Island Lodge is a tropical eco beachfront lodge on the island of Long Caye in the Lighthouse Reef Atoll, Belize. World Class scuba diving and snorkeling is at your doorstep including The Great Blue Hole and Half Moon Caye National Park and the Long Caye Wall sites. Escape the Crowds and Unwind with Bird Watching, Kayaking, Island Exploration, Soaking in Amazing Views and Hammocking. Endulge in delicious Belizean style cuisine. 4 Beachfront Rooms all with Spectacular Ocean Views. Whether your group has 2 or 20 people, we can accommodate you. The lodge has a central kitchen and dining area designed for connecting guests. A treetop observation deck has some of the best views on the island and is a favorite hangout for many guests. 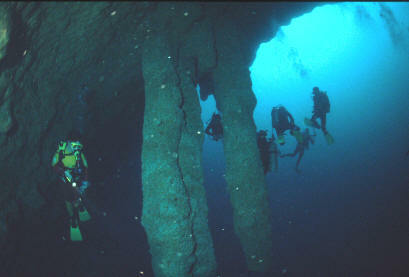 Our reefs and dive sites are considered some of the best in the world. Dive the Blue Hole, View the endangered Red-Footed Booby birds on the beautiful Half Moon Caye National Park, Catch a Grand Slam (Tarpon, Permit and Bonefish) or Kayak the Crystal Clear Atoll Waters.